JumpTo is the Unity Editor tool you’ll wish you had sooner. 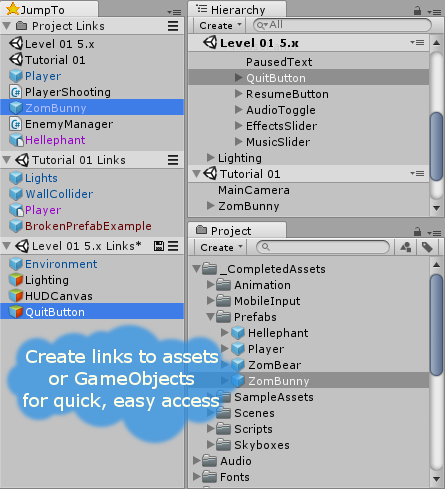 Keep GameObjects and Assets handy by creating links to them. Jump to those objects instantly, or use the link directly, and treat them just like the real thing! I’m sure you spend a lot of time searching for objects and assets while working on your game. That is valuable development time being wasted. Reduce the amount of scrolling and foldout expanding that you do. It sounds like a small thing, but, seriously consider how many times per day you click those tiny little arrows while working in the Unity Editor. Jump to any object or asset quickly and easily with JumpTo. Save your links for use across editing sessions! Supports multi-scene editing in Unity 5.3.1p1 or above (JumpTo v2.0 only)! Folders, for……whatever you need that for! Double-clicking a Link to an asset will open it for editing. Double-clicking a Link to a GameObject will focus the current Scene View on the object. Dragging Project Links from JumpTo is the same as dragging them from the Project View. Dragging Hierarchy Links from JumpTo is the same as dragging them from the Hierarchy View. JumpTo v2.0 supports Unity 5.3.1p1 or above. NOTE: With Unity 5.0 and up, JumpTo has problems saving links to prefabs in scenes. Unity changed the way prefabs are saved. In doing so, they also introduced a bug that wasn’t fixed until later, and I couldn’t find a workaround. Very sorry about this!